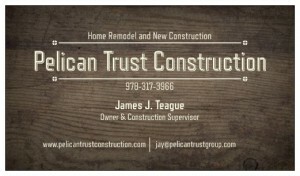 We are a North Shore based company with over 20 years experience constructing and remodeling homes in New England. We pride ourselves on quick and open communication that begins directly with the client at the point of design through to completion. As owner and hands-on Construction Supervisor, I will personally manage the process to materialize your specific vision. We specialize in home additions, basement and bathroom remodels. If you would like to talk about the details of your project, please text or call at your convenience and we can start the conversation. Our response will be quick and our goal is to give you all the information necessary for you to make the best educated decision during this remodel/construction experience. Our clients appreciate the leadership role that we take as advocates for them, ensuring the process runs as smooth as possible.